Record Store Day: 10 of the best-sounding vinyl records | What Hi-Fi? If not quite a lottery, there is a game of chance you play when buying your favourite music on vinyl. It isn't like CD or downloading a digital file, where identikit reproductions mean you're more or less certain to receive the music as intended. 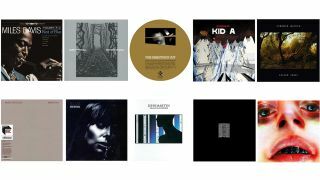 No two vinyl records are exactly the same, but deficiencies from mastering to press can also leave whole batches sounding sub-par, and in the gravest scenarios have you eschewing some of your otherwise favourite albums. No doubt we all have some of those gathering dust in our collections, but likewise there are those records where the vinyl sounds so good we can't help but spin it nearly every time. That's what this list represents. It is by no means definitive, but if ever you've read a turntable review on What Hi-Fi? you can bet at least one of these ten records will have been part of the test. Miles Showell has produced a number of half-speed masters of Brian Eno's work at Abbey Road Studios, including seminal albums Another Green World, Here Come The Warm Jets and Ambient 1: Music For Airports. The reason Music For Films makes it to this list though is precisely because we weren't totally enamoured with it before we heard Showell's half-speed version running at 45rpm; the sonic upturn in all from detail to dynamics, though admittedly often subtle, for us gave the music new dimension. You can read all about half-speed mastering in our interview with Showell, here. It's a scary thing, replacing an over-played record with a brand new press, but doing so with Joy Division's Unknown Pleasures worked out a treat for us. It's an album that feels suited to the format – it was originally mastered for vinyl, after all – with the rolled off treble offering warmth to Bernard Sumner's often hauntingly sparse guitar lines and Ian Curtis's affecting vocal, and it still comes with the same textured cardboard sleeve. Joni Mitchell's Blue is as essential to a record collection as bread and milk are in your weekly shop. We don't mean that vegans won't like it, but rather its intimate production desires a physical medium spinning as close to you as Mitchell's voice appears in the room. Given the number of times this truly beautiful album must have been re-cut, it stands to reason by now pressings are pretty much as good as they can be. That certainly rings true for us. While the Godfather of techno's productions may have mellowed a touch his relentless approach to releasing records shows no signs of abating. Unconcerned by the fashions of the day, Jeff Mills' Axis label has been releasing a steady flow of minimal music on vinyl since 1992. This release kick-starts The Director's Cut reissue project and forms part of the Axis Audiophile Series, so we're treated to four tracks of reissues and rarities given the level of attention you'd expect from a meticulous master of his craft. Gamma Player from the classic Humana EP (under his Millsart alias) is the warm and dreamy highlight, marrying tight, deep bass notes with crisp, hypnotic melodies. Kind Of Blue is one of those works that as good as defines its genre, and in many ways it feels peculiar to play it on anything other than vinyl. We know of those who cherish their charity-shop-bought pressings for their cracks and hisses, which we can see might complement well the authenticity of the music. But so marvellous a suite deserves to be heard in its full glory, on a clean and well-mastered pressing; at that point it is virtually irresistible. Don't be unnerved by Kid A's dimensions, you won't need a turntable that'll spin at 78rpm to play this double 10-inch record; whether it was made this way for aesthetic or simply due to Radiohead being willful, it's really just a 33rpm vinyl in fancy dress. It does sound fantastic, though. There's a boldness to the sound that is strangely euphoric, despite the album's often subdued phrasing, and a luscious quality to electronic and acoustic instruments alike that creates a genuinely immersive soundscape. We've spoken before about the benefits of listening to Lubomyr Melnyk's works on vinyl. Regardless of any sonic upturn, there is the implication that the effort you’ve made to place a record upon the platter prepares you for deep listening, but also the near hypnotic relationship between the pianist's continuous music and watching your record spin indefinitely that cannot be replicated. Melnyk released Fallen Trees at the end of last year, shortly before turning 70 years old, and it is proof that as a composer he is still well within his prime. As we mentioned earlier, there are those records whose sonic pallets are tailor-made for the warmer, less clinical treatment of a vinyl cut. For us, John Martyn's Grace & Danger is one such body of work. It is undoubtedly to do with his velveteen vocal draped stunningly over this nine-song set, but also in the rounded body of its accompaniment and the jagged edges he allows sometimes to cut through. Listen to tracks such as Sweet Little Mystery and Hurt In Your Heart both digitally and then on vinyl and we're sure the former could never quite sate you again. The argument that placing a record upon the platter helps prepare the mind of deeper listening is just as relevant when discussing Arca's self-titled album of a couple of years ago. It is an intriguing sonic collage, finding the line where music and sound art meet, and often it feels as though you can hear the needle picking its grimy textures from between the grooves. Just make sure your system is well enough equipped for when Arca goes low. Strange, Leon Vynehall's name springing to mind when compiling this list; his inclusion, though, is about more than some half-baked homonym. This album, released last year, was somewhat a departure from much of his previous house music output, and a generally more laid-back affair. Combining effusive string sections with textured synths, field recordings and subtle beats, Nothing Is Still makes the most of vinyl's full body and fills it with delectable variety of sonic elements.